Tramontina 80901/502DS is a best selling 4.4 cubic feet and 126 can capacity compressor style beverage fridge with a modern design and durable construction with a stainless steel body and a double paned glass door with a stainless steel frame and a sleek handle. It looks nice and modern, can be used as a freestanding cooler, weighs 68 pounds and measures 20.43W x 21.37D x 31.43H inches. The lowest temperature you can set it to is 34 degrees Fahrenheit. If you are not able to get it cool down properly it may be because of the bad ventilation at the rear. So you do need to have a couple of inches of clearance at the back and on the sides. 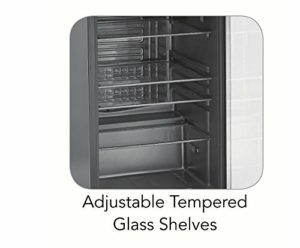 If you live in a humid climate and when the humidity gets high- over 70 degrees or so in the room you have the Tramontina fridge set up, the front glass door can get a little foggy. This is nothing to be worried about but it will make it harder to see the contents of the fridge. And the glass tends to show quite a bit of finger prints if you’re picky about that kind of stuff. A couple of other negative reviews on Amazon.com are because of the damage during shipping. When you first plug it in, it will take some time to get cold inside but the temperature will be stable when it reaches the minimum 36 degrees or whatever it gets to. But the first thing you will notice is how quietly it runs as the advanced compressor doesn’t need to do many cycles and is quiet enough when it does the cycles. Although it is designed for holding cans, you can also put your water bottles, cartons or bottles of milk, juice, sports drinks and more. 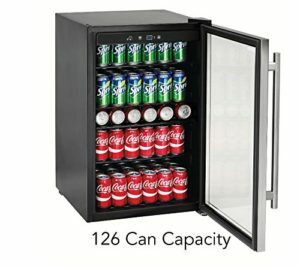 You have the four adjustable shelves and there is no reason why you can’t use this as a regular fridge to put your snacks and fruits in as well. It has a powerful compressor and the temperature is adjustable through the electronic thermostat with digital display. You can turn off the interior light if you wish, but not the temperature display. Although the minimum temperature is specified as 34 degrees, the actual temperatures reported by different customers are a little different. It uses roughly 322 kph per annum. The door handle is reversible and you can choose to open it from the left or right. It will help you free up some space for your groceries, as you’ll have this fridge just for your drinks. And another person commented on the temperature fluctuations, this was again mainly because of opening the glass door frequently. This one does keep things cool and the temperature stays consistently stable. Taormina 80901 is a nice looking product with a sleek and modern design in stainless steel and glass with blue LED light, is built quite solid and durable, does the job well- keeps your cans cold, runs very quietly and has an affordable price tag.